LARENCORE: U.S : Waffle House allowed cops to terrorize another Black person. U.S : Waffle House allowed cops to terrorize another Black person. David J. Johns started a petition to demand District Attorney Ernie Lee, drop ALL charges against Anthony Wall ! 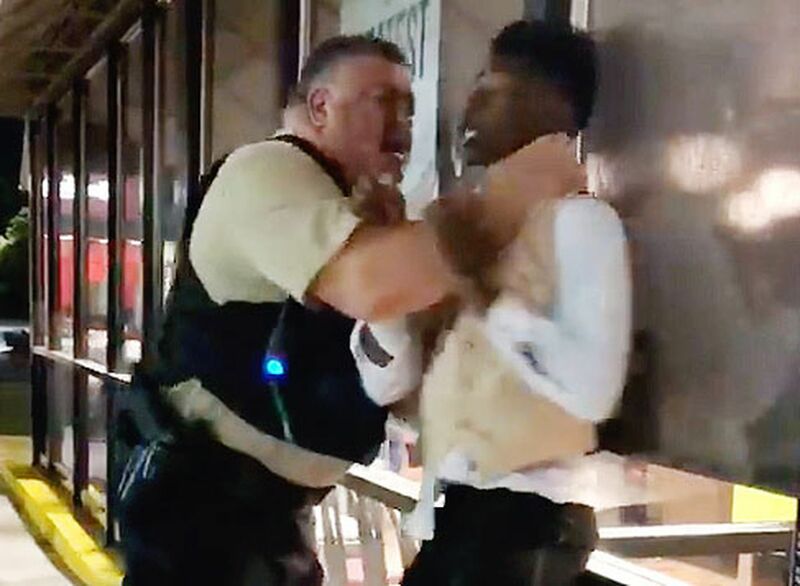 A young Black man charged with disorderly conduct but was assaulted by police at Waffle House. Tell Warsaw County DA Ernie Lee: Drop ALL Charges against Anthony Wall ! I was heartbroken when I first saw the video. Police were, yet again, violently assaulting a young gay Black man. In early May, what should have been a memorable time, turned into a painful nightmare. Anthony Wall is only 22 years old. He was enjoying his time escorting his younger sister to the prom. Afterward, he and a group of friends went to a Waffle House restaurant in Warsaw, North Carolina. When the group sat down at a table that was not cleared off, employees aggressively approached the group, creating an unwelcoming space and even threatening them. Employees began arguing with Anthony Wall, leading to them calling him racist and homophobic names and eventually calling the police. Sign the petition: Demand justice for Anthony Wall NOW! When police arrived onto the scene, it escalated and turned violent.Officer Frank Moss assaulted Anthony and was caught on video choking the young man. Anthony screamed “get off of me,” but was then arrested and charged with disorderly conduct. He was even forced into the arresting officer’s car with a police dog present in the car, despite Anthony begging to be removed. Waffle House and the police continue to work together to bring terror against and viciously assault Black people. Enough is enough. We cannot let the same traumatizing experiences keep happening to our community. I am angry and devastated for Anthony. We must join with him. We must demand the charges be dropped now. Sign the petition: Anthony Wall was just enjoying a night out, he deserves justice. This is not about a person resisting arrest or not complying. No one should be brutally beaten--especially when they’ve done nothing wrong. But Warsaw Police Chief Eric Sutherland defended the police. Chief Sutherland, said that an officer can use physical force on a subject if the person is not complying. Notably, Anthony was not only unarmed but the officer was more than twice his size. The Mayor of Warsaw released a three-and-a-half minute statement in support of Officer Moss, attempting to justify the treatment of Anthony during the arrest. The police officer was clearly acting out of control. Yet, Anthony is the one facing charges--it doesn’t make sense. District Attorney Ernie Lee has a responsibility to hold the Warsaw Police Department accountable for their despicable actions.Too many times, we see our people being attacked, profiled and even killed by violent, reckless cops and nothing never happens. But not this time. We must turn up the pressure on DA Ernie Lee. Even with an investigation ongoing, we know that Anthony Wall did not commit any crime. Right now, DA Ernie Lee can easily drop the charges at his discretion. DA Ernie Lee must do the right thing for Anthony and our communities. The police are not above the law -- plain and simple. Tell Warsaw County District Attorney Ernie Lee to drop the charges against Anthony Wall. Black people are still reeling from the horror that Chikesia Clemons was forced to endure just over a month ago. Like Anthony Wall, Chikesia was simply just a customer at a Waffle House restaurant in Alabama. Employees created an unsafe place for Chikesia and called the cops. Chikesia was assaulted by police, even ripping her clothes off. We have all seen that disturbing video. That is why we now must stand with Anthony Wall. Everyone has the right to feel safe in public spaces. Both Anthony and Chikesia’s cases coincide with a flurry of very public racial incidents highlighting threats to Black bodies in public spaces. Police violence is just another ugly reminder that Black people are treated as if our lives don’t matter. There’s a long and frightening history of Black people being banned and discriminated against in restaurants, public pools, and restrooms. It is very troubling that Waffle House and police departments across the United States are seemingly working hand in hand, non-stop to silence and keep Black people away. As a civil and human rights community, we demand answers. No human being should endure the type of verbal and physical abuse that Anthony experienced and any charges against him should be dropped immediately. Please join us in signing this petition to ensure justice for Anthony. Remember none of us are free until all of us are free!